Looking for a quick dinner idea? 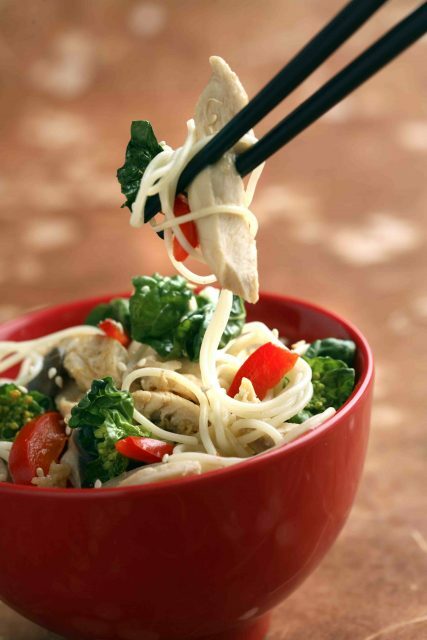 Chinese stir-fries are the perfect mealtime solution. Try this for a healthy weekday meal. 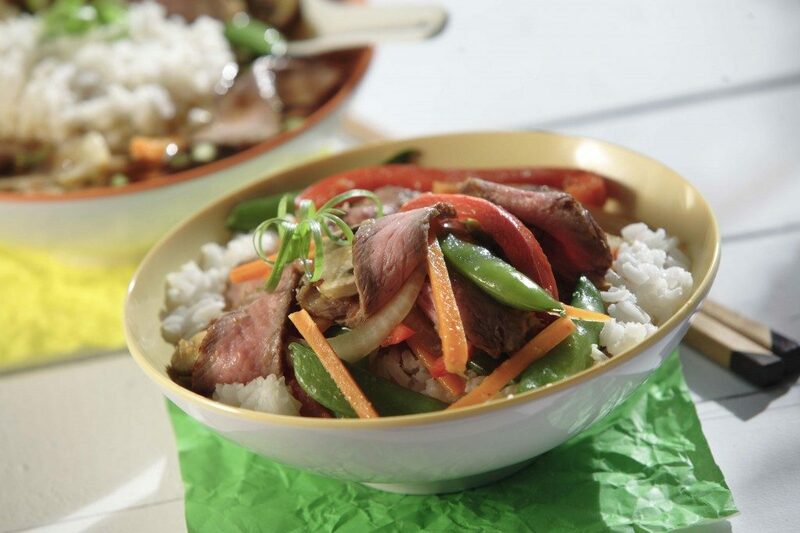 It's nicely seasoned with fresh ginger and the steak is sautéed to perfection in a quick method cooking style. 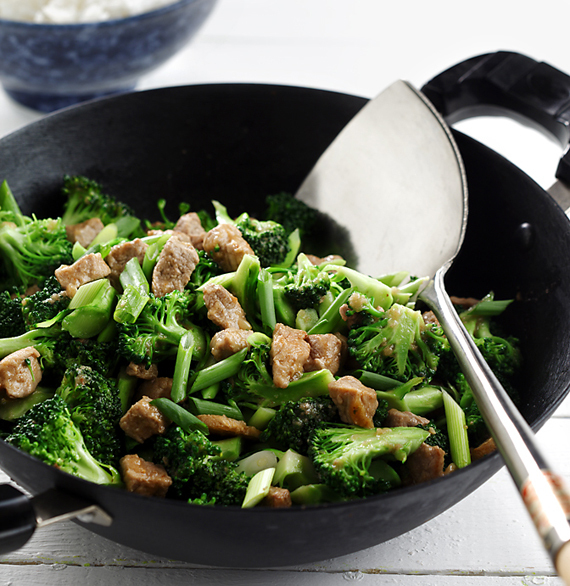 This stir-fry recipe is filled with lots of vegetables to make an all-in-one meal. Serve with rice, noodles or just on its own. Cut beef in half lengthwise and then cut crosswise into thin slices; set aside. 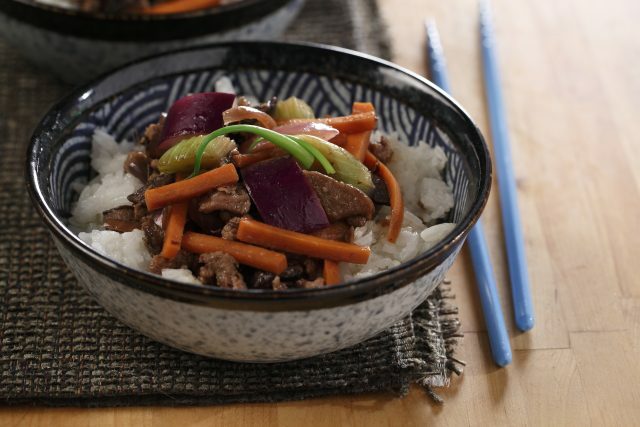 In a small bowl, combine soy sauce, cornstarch and ginger. Stir until cornstarch dissolves. Set aside. Heat a large skillet or wok over medium-high heat. Add 1 tbsp of canola oil (15 mL), coating bottom evenly. Add beef slices and cook until browned, stirring constantly. Remove from skillet and set aside. Return skillet to medium-high heat; add remaining 1 tbsp canola oil (15 mL). When hot, add carrots, onion, bell pepper, mushrooms and garlic, and stir-fry 3 minutes or until tender-crisp. Add beef, snap peas, red pepper flakes and soy mixture to vegetables in skillet. Cook for 1-2 minutes, stirring constantly, or until sauce thickens. Chef’s Tip: When preparing stir-fries, try to cut up the vegetables and meat in the same size for fast, easy and even cooking. Nutrition Tip: Tomorrow’s lunch? Make good use of leftovers by including some of the remaining stir-fry in a whole-grain wrap or pita.